This entry was posted in Actors, History, Movie, Reviews, Submarine, Trailer, U-Boot, War Movie, WWII and tagged Action movie, Bill Paxton, Harvey Keitel, Jon Bon Jovi, Matthew McConaughey, Movie Trailer, Movies, Reviews, Submarine, Submarine combat, Thomas Kretschmann, U-571, U-Boot, WWII. If you want to see all submarine movies rolled into one – see this movie. It has absolutely every sub cliche you can think of. You would have to see ten sub movies to equal U-571. That’s great bang for your buck! You don’t seem too upset about an American movie stealing the credit for getting the Enigma machine. Totally agree with you. Since the movie isn’t exactly good and the crew wasn’t looking too good it didn’t upset me but I found it added a taste of absurdity to the whole. I have watched this movie years ago…I couldn’t even remember the detail anymore., The reason for watching it is only Jon Bon Jovi. That’s suprising that you saw this. Probabyl on TV I suppose. Bon Jovi isn’t even in it for very long. He wasn’t even all that bad. 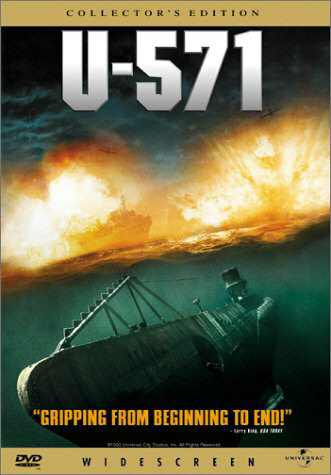 U-571 is a really good sub movie, probably not the best, my vote would go to Das Boot (1981). One that you should watch if you get the time is Phantom, released 2013 starring David Duchovny from x-files fame. Thanks a lot for bringing it to my attention. I wasn’t aware of Phantom.